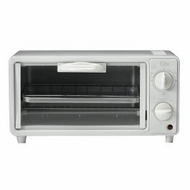 You can bake, broil, roast but most of all, enjoy many foods with elite by Maxi-Matic's stylish 2-slice toaster oven. Features include heat selector, 15 min. Timer., convenient baking tray and a large 4-1/2-liter capacity.